Unbeaten heading into the Group One showpiece, the Charlie Appleby-trained Quorto was cut to 8-1 from 12-1 for next year’s 2000 Guineas by Ladbrokes and after a clear-cut success. He faced stiff opposition in the shape of Aidan O’Brien’s Anthony Van Dyck, winner of three of his four races prior to this, but Quorto was still sent off the 11-8 favourite. The son of Dubawi – the winner of the National Stakes in 2004 – travelled much sweeter than the Ballydoyle runner and William Buick cruised into the lead with Ryan Moore hard at work. “On the dam’s side you have a lot of stamina, as she (Volume) was placed in the Oaks. He’s a horse that, from what we’ve seen so far, he travels very well through his races. “If you were to pin me down now I’d say a mile was his trip and a mile and a quarter might be his maximum, just because of the make-up of the horse. 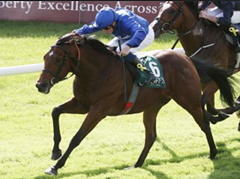 “He’s very much a Dubawi, he is his father, the stamp of him, the way he travels through his races, his mentality. He’s showing a lot of Dubawi about him. “If you said that hypothetically he’d be a Derby horse I’d be sitting on the sidelines for the minute and saying ‘well let’s try to hopefully get a Guineas out of the way and work our way from there’. “He’s an exciting horse. The Dewhurst is obviously the most logical route, but I’ll flag up that he is a Dubawi and he’s Dubawi’s first Group One-winning two-year-old colt. He went on: “As a rule this time of year is the time the Dubawi two-year-olds start to thrive, so that’s why I’m excited about this horse in respect of what he’s done through the summer months. “I’m privileged that a lot of Dubawis have gone through my hands and I hope I’m learning on the job. “He’ll tell us if he’s coming out of this race well and if not it doesn’t worry me, because I know from two to three is the time when they do well. “The way he won his first two starts he probably didn’t learn a lot on the job. It’s very nice to have a horse that travels, but when you start stepping up in calibre of race sometimes you’d wish that they had got into a bit of a dog-fight. O’Brien felt Anthony Van Dyck lost little in defeat. The Ballydoyle trainer said: “We were very happy. We always thought that he’d want to step up to a mile and only because he won the Futurity so well we stayed at seven. “Coming to the line he was coming again. The winner is a very good colt, but we were very happy with our horse. He’ll handle better ground and will be very comfortable on better ground.